When a tornado passes through a town, the results are usually devastating. But in this "twisted tornado tale," the opposite happens. Thanks to a little girl named Miss Jane, who wished on a star for her town's safety, the aftermath of a tornado is more than confounding. The twister bales all the hay in tall, neat stacks. . . plows a perfect field for farmer Grady O'Brady. . .It even folds the clothes on Aunt Beulah's clothesline! As they did in their first book, Brewster, the Rain Makin' Rooster, the Ross brothers have blended whimsical, vibrant art with clever, catchy verse that is guaranteed to delight young readers. Age doesn't matter, however, when it comes to chuckles. The hilarious scenarios and clever rhymes will entertain readers of all ages. 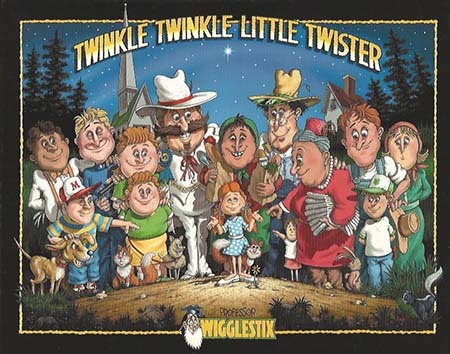 As Tim puts it, Twinkle Twinkle Little Twister has "a rip-roaring beginning, a mighty mangled and mystifying middle, and a high-flying, happy ending." Both of the Ross brothers' books end with a page full of interesting, little-known weather facts. Tim Ross has been a "TV WeatherGuy" for more than twenty years, most recently in Nashville, Tennessee. He and his illustrator brother, Scott Ross, have teamed up to create another fun rhyming book on the subject of weather.